April seems to be going very fast, and it’s just over two weeks since I had a busy Saturday afternoon in London. 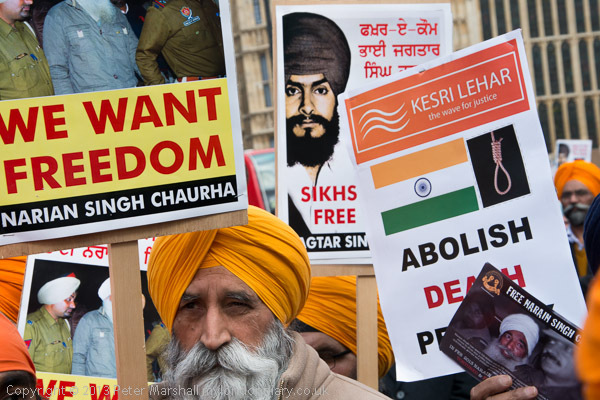 It started with the Sikhs, who had come to protest outside Parliament asking our government to put pressure on India to drop the death penalty, and in particular not to hang a number of Sikhs, some of whom have been on death row for many years. It wasn’t a particularly visual event, and I had to work hard to find pictures. The platform at the front was surrounded by scaffolding, making it hard to photograph the people on it except as head and shoulders images, and although they had an effigy of a hanging man, even that was made difficult to use by the scaffolding poles. Of course there were some fine faces and beards in the crowd, who were simply sitting or standing listening to the speeches, but I didn’t want simply to photograph characters. I was back to using the Nikons again, and this image shows the set up on the stage – I was poking the 16mm between scaffold poles at the front of it, and needed the tilt to get it all in with some of St Stephen’s tower behind. As I went up to take it, I reached in my bag for the 10.5mm, which might have done a better job, and found it wasn’t there. After a second or two of panic that I’d lost it, I realised that it was still in my toy camera bag with the Fuji body I’d been using it on earlier in the week, and I’d simply forgotten to put it back. All I could do was curse, and remind myself that I should always find the time to check my gear properly before I rush out and run for the train. 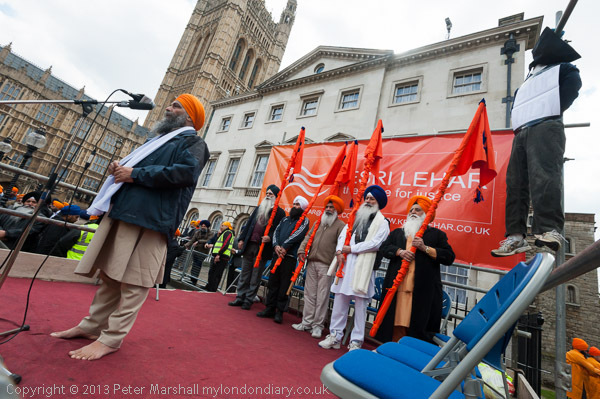 This was I think my best pictures of the event, including a great beard and turban and with careful position and framing to make use of the various placards – as well as just a little of the Houses of Parliament peeping through. I had put the 70-300mm in my bag – its a lens I don’t always bother to carry, and it did come in useful in a few pictures, as you can see in Vaisakhi “Save a Live” Vigil. This entry was posted on Sunday, April 21st, 2013 at 11:40 am and is filed under My Own Work, Photo Issues. You can follow any responses to this entry through the RSS 2.0 feed. You can leave a response, or trackback from your own site.